Mark, B. G., Geoffrey O. Seltzer (2005). 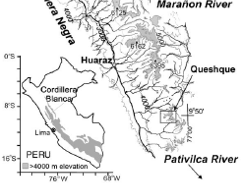 "Evaluation of recent glacier recession in the Cordillera Blanca, Peru (AD 1962-1999): spatial distribution of mass loss and climate forcing." Quaternary Science Reviews 24: 2265-2280. Observed heat loss can be explained by sensible heat transfer related to a temperature rise combined with latent heat decrease related to a an increase in specific humidity. A transmissivity model within a DEM indicated that solar radiation related to altered cloudiness was not a predominant climate forcing. -There are many interconnected surface energy-mass fluxes and changes in precip and humidity can affect mass balance through altering all-wave radiation that actually controls mass balance. -I should look at humidity trends in the NW as well and possibly relate that to ablation rates. An increase in temperature raises the saturation vapor pressure, causing a rise in specific humidity under the controlling assumption of constant relative humidity. More humidity in the air would probably also induce increased cloudiness and a greater longwave radiative flux to the glaciers but the clouds would at the same time block incoming direct radiation. -Aim of the paper is to show that glacier recession in the andes of Peru has been forced primarily by increased tropospheric temp with an associated decrease in humidity. -Solar radiation, primary energy responsible for melt, depends on the “solar geometry” or the orientation of the glacier relative to the sun and surrounding topography. -Warmer temps throughout a region may override the geometrically dependent solar influence and force more spatially symmetrical glacier recessionLook at how this is on Hood & Rainier and use Mark’s paper to cite. - "Greenhouse forcing" involving increased temps and absolute humidity has replaced the spatially variable recession of the early 20th century on Kenyan Glaciers. -Diurnal convection patterns cause a zonal asymmetry in the radiation balance in the region. Where glaciers are more sensitive to this individual glaciers with western aspects reach lower altitudes locally. – Thus the glaciers in 1962 seemed to be more sensitive to solar radiation than regional precipitation. -They compared the difference in volume between glacier area of two different surfaces. I could do this if I derived DEM’s from ASTER for the years I pick but how accurate would that be when I then compare them to the LiDAR? -The authors used a “TopoView” program to model the solar radiation based off surrounding topography. -The paper looked at insolation values with respect to solar radiation and found that min for southern aspects and max for northern aspects (opposite of northern hemisphere). becoming exposed to more intense annually averaged radiation over time. But the modeled distribution of averaged radiation receipt does not match the observed pattern of maximum ice loss. The insolation is negatively correlated to surface lowering. -The paper uses Oerleman’s energy balance equation at the surface of the glacier. B= SW+LW+Qe+Qs. -In this paper Mark assumes that any change that might effect the SW to the surface could force significant mass loss and should also cause a differential thinning based on the solar geometry of the glacier but in this study area the solar geometry does not account for the observed spatial pattern of melt. Will it apply on Hood or Rainier? -Vertical gradients of temp and humidity determine the magnitude and sign of the energy fluxes such that sensible heat is typically positive and toward the glacier surface while latent is negative away from the surface. -Without any direct mass balance measurements the AAR method is favored over other methods to estimate ELA from glacier dimensions. -Temperature increases in the Andes far exceeds the global prediction. -The asymmetrical pattern of ice mass loss can be explained by accounting for the different glacier hypsometries under a spatially homogenous temperature increase. -Higher tropospheric temperatures would directly enhance the sensible heat flux to surfaces in all directions uniformly as a function of elevation but the ice volume lost would vary as a function of hypsometry. -Not only would increased temps enhance mass loss via the sensible heat flux, but any associated specific humidity increase would increase ice loss as the reduced latent heat flux leaves energy available at the surface to create melting. -Review the list of conclusions with this paper later if needed. Hastenrath, S., Kruss, P.D., 1992. The dramatic retreat of Mount Kenya’s glaciers between 1963 and1987: greenhouse forcing. Annals of Glaciology 16, 127–133. Jones, P.D., Osborn, T.J., Briffa, K.R., 2001. The evolution of climate over the last millennium. Science 292 (5517), 662–667. Kuhn, M., 1989. The response of the equilibrium line altitude to climate fluctuations: theory and observatio ns. In: Oerlemans, J. (Ed. ), Glacier fluctuations and Climate Change. Kluwer, Dordrecht, pp. 407–417. Lean, J., Rind, D., 1998. Climate forcing by changing solar radiation. Journal of Climate 11, 3069–3094. Meier, M.F., Post, A.S., 1962. Recent variations in mass net budgets of glaciers in western North America. IAHS 58, 63–77. Oerlemans, J., 1994. Quantifying global warming from the retreat of glaciers. Science 264 (5156), 243–245. Oerlemans, J., Knap, W.H., 1998. A 1 year recordof global radiation and albed o in the ablation zone of Morteratschgletscher, Switzerland. Journal of Glaciology 44 (147), 231–238. Peterson, T.C., Vose, R.S., 1997. An overview of the global historical climatology network temperature database. Bulletin of the American Meteorological Society 78 (12), 2837–2849. Ramanathan, V., 1988. The greenhouse theory of climate change: a test by an inadvertent global experiment. Science 240 (4850), 293–299. Yanalak, M., Baykal, O., 2003. Digital elevation model based volume calculations using topographical data. Journal of Surveying and Engineering 129 (2), 56–64. It would be interesting to look at humidity trends. But you could also look at precipitation trends. There's a paper by Jessica Lundquist on how north facing slopes are not nearly as temperature sensitive as south facing slopes. I'll send this to you by email. Vertical accuracy of ASTER is not not likely to be sufficient to show the changes but it's worth looking at. I was surprised to hear that the glacier at Verbier has deflated 25 m. So, if you can see negligible changes in the elevation of rock areas and large changes in the elevation of ice surfaces, it would be significant. This could be a paper in itself. We could use the lidar data as "ground truth" for surface elevations from 2008. AAR method would likely work well for Mt. Hood.